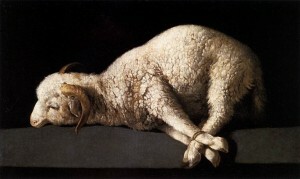 Was the Lamb slain since the foundation of the world? The Names having been written? Why do so few say “the book”? Just a quick look at this verse, in order to show some difficulties in translation, and their effects. I don’t think it actually says that Jesus died since the foundation of the world, but the majority of translators do, so I need to explain why I disagree. There is, as I will show in the end, a substantial minority of translators who translate the verse in accordance with what I understand it to mean. It may come as no surprise that translating this is straightforward, to something like, “and all those living in the world will worship him” (“him”, or “it” referring to the beast, from verse 7). οὗ οὐ γέγραπται τὸ ὄνομα αὐτοῦ ἐν τῷ βιβλίῳ τῆς ζωῆς τοῦ ἀρνίου τοῦ ἐσφαγμένου ἀπὸ καταβολῆς κόσμου. I throw the dog’s ball with my hand. “I” [nom] throw “the ball” [acc] “the dog” [gen] “the hand” [dat] “me” [gen]. The words “with” and “of” are not always required in the Greek because the case of those clauses allow us to understand how the clause is functioning in the sentence. In this case, assuming “by” my hand instead of “with” my hand would be just as correct, but slightly more odd-sounding. The case is indicated by certain modifications to the spelling of the words. We don’t need to go into that level of detail here, because when you hover over the Greek words on this page you will see a code which indicates the case of that word, amongst other attributes. Look for the cases that I listed above. κόσμου “the world” is genitive because the “conception” belongs to it. Now we ask the questions. Let’s start with number 2, “in the book”. What is “in the book”? In fact, grammatically, it could be τὸ ὄνομα “the name”, or it could be αὐτοῦ the genitive “him” (the one whose name it is). Is “the name” in the book, or is it “the one who’s name we have been talking about”, in the book? Clearly a person is not going to be in a book, but a name is. That makes our translation choice a simple task. Also, if this was referring to the person it would probably include a pronoun for “who”, so that it read, “the name of him who is in the book”. That would be more natural, but I’m just demonstrating how an ambiguity can arise with cases. What about clause 3: “of life”. What does “the life” refer to? Again, grammatically it could refer to the “name”, so that the “name of life” is “in the book”. Our knowledge of the rest of Scripture helps us, however, to know that we are talking about “the book of life”. Again in Clause 4: “of the lamb which was slain”, requires some thought. Is it “the book, which arises from the life of the lamb which was slain”?, or “the book-of-life belonging to the lamb which was slain”? Because of what we know from elsewhere in the story we can be certain that it is the latter. But grammatically, both are possible. So that brings us to clause 5: “since the conception of the world”. What is “since the conception of the world”? Having acknowledged that all three possibilities are grammatically correct, I will now assess these choices. So this, despite being the most widely chosen, is simply not a good translation. It merely falls out from the Greek word order, but introduces a theological oddity which is not introduced by either of the other two alternative options, is not supported by Scripture anywhere else, and contradicts the Gospel accounts. I would not be surprised if the simple fact that the earliest translations into English (AKJV, for example) made this choice, provided a heavy presupposition in favour of it in subsequent translations. If the names of the saved had been written “from the foundation of the world”, then God foreknew who would be saved, and wrote their names down at that initial point in time. In the Middle Ages, Calvin and Arminius famously argued about the nature of this foreknowledge. Both believed in the principle of God foreknowing whom He would save. Frankly, I’m convinced they were wrong. The texts they were reading, with respect to this foreknowledge, did not mean what those men thought they meant, and they seriously erred. Unfortunately there are now many layers of doctrines now piled up on top of them, which makes it a delicate task indeed to unpick the mess. I have attempted this task in my articles on Predestination and on Election. In short, the Bible doesn’t say that God foreknows individually whom He will save, before they are born. To ponder that question is the job of philosophers, and not theologians. Does this mean that people’s names are written in the Lamb’s book of life before they are born? And I saw the dead, great and small, standing before the throne, and books were opened. Also another book was opened, the book of life. And the dead were judged according to their works, as recorded in the books. Notice that the dead were judged “according to their works, as recorded in the books”. These “books” are not the “book of life”. In any case, Psalm 139:16 is not referring to the “book of life”. This is clear because it does not talk about “my name is written…”, but rather it is saying that my lifespan (“days”) has a place in “your book”, which is one of “the books” of Revelation 20:12. That’s where my “works” will be recorded, in preparation for Judgement Day. So in summary, I find no support for the notion that people’s names are written in the Book of Life before, nor at, the foundation of the world. By elimination, that leaves us with the book, as the thing which is “from the foundation of the world”. Whether or not the other options are possible, this one makes perfect sense. Obviously the Book of Life has existed from the foundation of the world, since it is the way by which God will record the names of those who will inherit life. So even if this was not what the original author meant, it would still at least be sensible and accurate. Neither of the other options seem to be. Every person on the earth from the beginning of the world whose name has not been written in the book of life of the Lamb Who was killed will worship this animal. This translation sets our frame of reference to “from the beginning”, and talks about those “whose name has not been written”. This means that the book was there, but the names could have been written at any time. The others are all similar in construction, with the exception of the WE, which separates a new sentence, “That was God’s plan since the world was made“, which again, indirectly means that the book was always there, but the names may not have been. Besides the Greek word order, and the deference to the AKJV, I suspect that a deeper reason is that, whereas the Greek sentence flows quite naturally in Greek, interpreting it to mean that the book is from the beginning creates an awkward English sentence. The other possibilities produce more direct translation into English phrases. No translator would use that as a reason to translate it a particular way, but it could subtly influence the translation because those alternatives present themselves as more “natural”. When accompanied by such a powerful precedent as the AKJV, the power of suggestion may be enough to tip the balance. In any case, I suggest that refers to the book being “from the foundation of the world”. That’s the only way the verse can make any sense whatsoever.